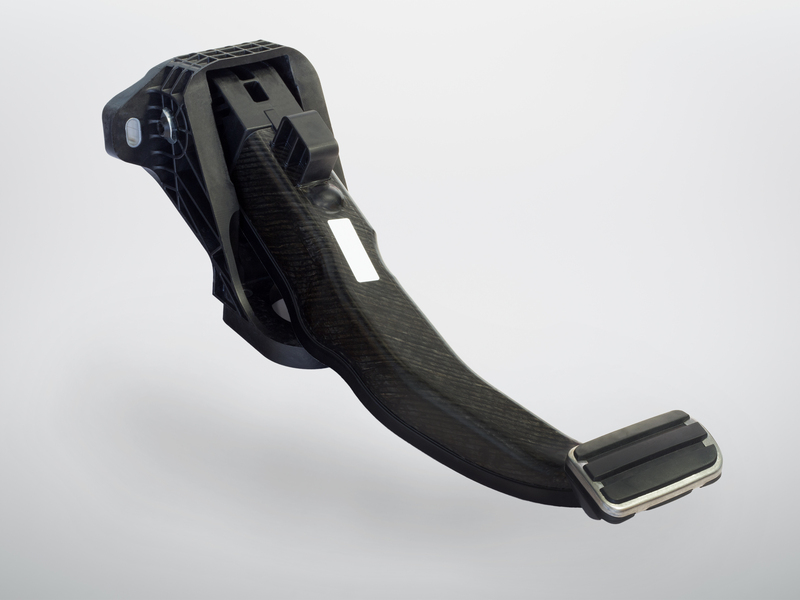 The entire development of the plastic brake pedal – right from component part and tool design through the all-up process development to component part testing - was in the hands of BOGE Rubber & Plastics. In the structural design of the component parts, BOGE was supported by Bond-Laminates, a subsidiary of LANXESS AG. The plastic pedals can be manufactured in high quantities at costs comparable to conventional steel brakes, due to the high functional integration of the plastic version and the completely automated production. In addition, the pedal can be produced in an economical one-shot process in a large-scale injection molding cycle. The brake pedal was designed in two versions, one each for left and right-hand driven vehicles. The fact that drivers brake with their left or right foot had also to be taken into account in the design stage. For this purpose, the load path was optimized according to the different torsional directions. The component part is produced by hybrid molding in a one-shot process in short cycle times suitable for large series. The SPE Awards are among the most prestigious awards for innovations in the automotive industry and its suppliers. The award has been assigned every one and a half year since 1992. This year's awards were presented in Düsseldorf on 17 October. 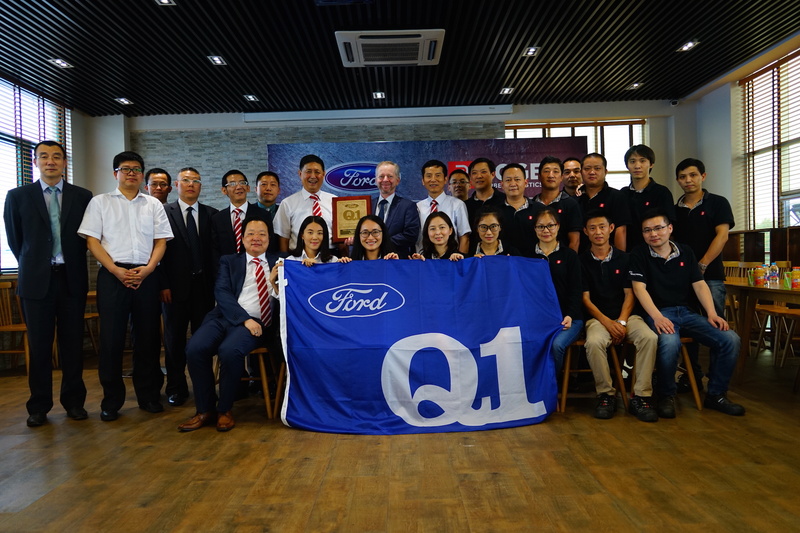 BOGE Elastmetall (Shanghai) Co. Ltd has received the Q1 Award from Ford Motor Company. With the award, Ford honors the excellent performance of the BOGE Qingpu site. The renowned price is the highest award that Ford can give to its suppliers. It is awarded to those suppliers who meet the high requirements of the automotive manufacturer regarding production systems, quality control and management, customer satisfaction and continuous improvement. "Q1 is not an end, but a start. Let's make more effort to maintain Q1, said Mr. Jun Liu from Ford, who handed over the Q1 flag and the medal. "The quality award is both an incentive and a challenge for all employees of our location not to be content with what has been achieved, but to improve our processes continuously to continue to be for our customers an efficient and reliable partner," said plant manager Yongwei Yu during the ceremony. The BOGE Rubber & Plastics Group will present itself for the first time under the new corporate umbrella at the International Suppliers Fair (IZB), which will take place from 18th to 20th October in Wolfsburg. The BOGE Rubber & Plastics Group will present itself for the first time under the new corporate umbrella at the International Suppliers Fair (IZB), which will take place from 18th to 20th October in Wolfsburg. In close cooperation with the international automobile manufacturers, BOGE Rubber & Plastics develops and manufactures solutions for comfort and safety in the chassis and drivetrains of vehicles of all types. In addition, it also makes a significant contribution to the lightweight construction of modern vehicles with sophisticated plastic components and modules. BOGE Rubber & Plastics will provide an overview of the product portfolio of the sectors NVH car chassis, NVH powertrains and plastics at the IZB. NVH stands for 'Noise, Vibration, Harshness', i.e. the undesirable interference effects of noise, vibrations and roughness. BOGE Rubber & Plastics opened a new office in Yokohama (Japan). The global strategy of the automotive supplier is aimed at being present in the most significant local automotive markets. This also includes Japan, especially because here a number of internationally successful operating vehicle manufacturers have their headquarters. By establishing the new office in Japan, BOGE plans to further expand its business with the Japanese OEMs (Original Equipment Manufacturers). Head of the new branch, which operates under the name of "BOGE Rubber & Plastics Japan K.K.," is Mr. Naoki Matsuda. He has many years of automotive experience in the Japanese market. BOGE Rubber & Plastics, global leader in the field of vibration control and plastics solutions in the automotive industry, continues to set its course for growth. The automotive supplier achieved in the fiscal year record sales of around EUR 740 million. This means an increase of almost 8 % compared to last year’s figures. For comparison – the economy grew by 3.1 % in 2015 worldwide and the global automotive production by 1 % to 90.5 million cars and trucks. “We are growing faster than the global automotive production. The mainstay of this development is our global production network with locations in the most important markets and our innovative strength,” characterized Dr. Torsten Bremer, CEO of BOGE Rubber & Plastics as being the most important growth drivers during the annual press conference on Friday, April 29 in the company’s headquarters in Damme, Lower Saxony. 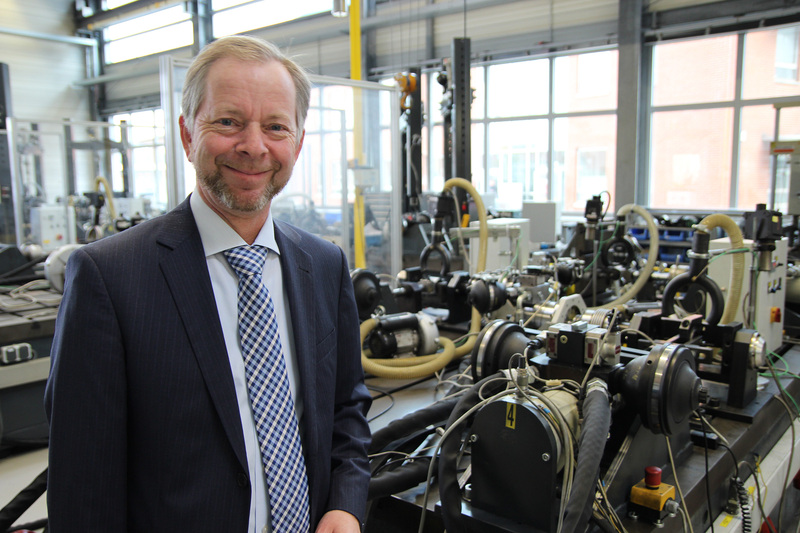 Investments also reached a record level at BOGE Rubber & Plastics with EUR 55 million in the fiscal year 2015. This represents an increase of 51.5 % compared to the previous year. "Our Chinese owner is banking on continuity and reliability. He supports our growth strategy. All investment commitments made in 2014 in the course of the sale of the Rubber & Plastics division of ZF Friedrichshafen AG to the Zhuzhou Times New Material Technology Co., Ltd. (TMT) are being realized," emphasized CEO Dr. Torsten Bremer during the press conference. For the automotive supplier it was the first full fiscal year under the new Chinese owner. Great importance was attached to a close and trustful German-Chinese cooperation right from the beginning on both sides. Thus, for example in 2015, 50 managers and employees from different functions of the Chinese owner TMT participated in the management exchange program “Learn from BOGE” (“Lernen von BOGE”) lasting several weeks in Germany. Around 40 % (EUR 293.7 million) of the worldwide turnover of EUR 740 million were generated in Germany; 22.5 % (EUR 166.2 million) in North America and 15 % (EUR 116.6 million) in Asia / Pacific. The number of employees rose by 115 to 3,765 - in particular at the locations Damme, Trnava and Shanghai. The automotive supplier mainly invested in the fiscal year 2015 in large-scale projects at the German sites Damme and Simmern and the construction of a second factory building in Trnava (Slovakia). The investments in the locations in Hebron (USA) and Shanghai (China) ranked on the second place. The largest single investment project 2015 was the construction of a production hall, including completely new machines and equipment at the Damme location for the production of plastic pedal modules. Here, about EUR 12 million were invested in 2015 alone. The total investment volume for this project will amount to nearly EUR 25 million. The investment includes inter alia two fully automated assembly lines and 10 injection molding machines. 17 robots are intended for finishing and assembly. The commissioning of the assembly lines has already taken place. The BOGE Rubber & Plastics Group expects additional annual sales of up to EUR 60 million thanks to this large-scale project. The official inauguration of the major project "pedal modules for MQB platform” will take place this summer. Damme location with a turnover of around EUR 249 million and more than 1,000 employees is the largest site and headquarter of the automotive supplier. Another major project of the past year was the engine mount system MLBevo (Modular Longitudinal toolkit of the second generation) at the location Simmern (Hunsrueck). BOGE produces for this platform hydraulic, dip, switchable and active engine mounts in 36 versions for the automobile manufacturer Audi. The first vehicle of this platform is the new Audi Q7. Investments in this project amounted to approx. EUR 7 million in 2015. The high investment volume should also contribute to further expanding the position of BOGE Rubber & Plastics as a technology and innovation leader in many product areas. One example of this are the active engine mounts which ensure a significantly improved vibration and noise behavior compared to conventional engine mounts. In addition, the plastic lightweight components are increasingly successful on the market, for example in the field of pedal modules. Lightweight design is in the focus of the automobile manufacturers to reduce fuel consumption. Products from BOGE Rubber & Plastics can make a measurable contribution to achieve this goal. In the fiscal year 2016, again a similarly high investment volume is scheduled as in 2015. About half of the investment volume is allotted to the German locations and a quarter to the Trnava location in Slovakia. Based on a projected global economic growth of 3.1 % and an increase in worldwide automobile production (cars and trucks) from 3.2 % to about 94.2 million units, BOGE anticipates sales growth of up to 6 % in 2016. In the worldwide fastest growing automotive market China, the factory which was founded in 2008 in Qingpu near Shanghai has reached its capacity limit. "In order to continue to successfully meet the market growth of the automobile market in China, we have set the right course for additional capacity," said Dr. Torsten Bremer. BOGE will strengthen its market position and increase the market share also of plastic and powertrain suspension applications by establishing a new plant in China. The new company BOGE Rubber & Plastics WUXI has already been founded. Start of construction in Wuxi (about 100 kilometers from the production site in Qingpu) is expected to be in the autumn of 2016. The start of production is planned for 2017. The integration of all automotive activities of the new parent company in BOGE Rubber & Plastics Group also is in full swing. Thus, BOGE will now focus on all global automotive topics, and the parent company TMT focuses on business such as railway and industrial applications. This involves the intended integration of a previous location of the new parent company (in Zhuzhou, China) into the BOGE Rubber & Plastics Group. The new company BOGE Rubber & Plastics Zhuzhou has already been founded. From July 2016, this company will also officially belong to BOGE Rubber & Plastics in accordance with the legal requirements. Thus, the BOGE Rubber & Plastics Group already includes three locations in China soon. BOGE Rubber & Plastics now has expanded significantly its capacities in Slovakia with the construction of a second production hall. Reason for extension in Trnava is the good order situation. The investment volume is about 7 million €. In the new hall with a production area of over 5,000 square meters, about 110 employees are already at work. 30 of these employees were freshly recruited and 80 were recruited from the staff of the previous production hall. The production can now arrange in logical complexes. A strict separation of the production of rubber-metal components and plastic parts will be implemented. In the new hall, exclusively plastic parts will be produced. Here, among other products steering column height adjusting levers, airbag housings and pedal modules are manufactured. BOGE Rubber & Plastics has been represented at the location in Trnava since the year 2000. About 770 employees generate in Trnava an annual turnover of more than 100 million €. (April 2016).